Bearing testimony to generations of master cooks who diligently followed culinary traditions in the kitchens of the Garh, Chanoudgarh honours the traditional cuisine of Rajasthan while adapting it to modern palette. Inspired by Rajasthani, Marwari and central Indian cuisine, each meal is painstakingly prepared in the traditional kitchens of the palace, where every ingredient – including the wheat and pulses are sourced from our organic farm and our dairy farm even provides the milk! Thakurani Sahiba Marudhar Kumari of Chanoud presides over her kitchen in person, taking special care that the spiciness of each dish is carefully adjusted, giving our guests the option of choosing non-spicy meals. We offer our guests a variety of dining locations spread throughout the property. 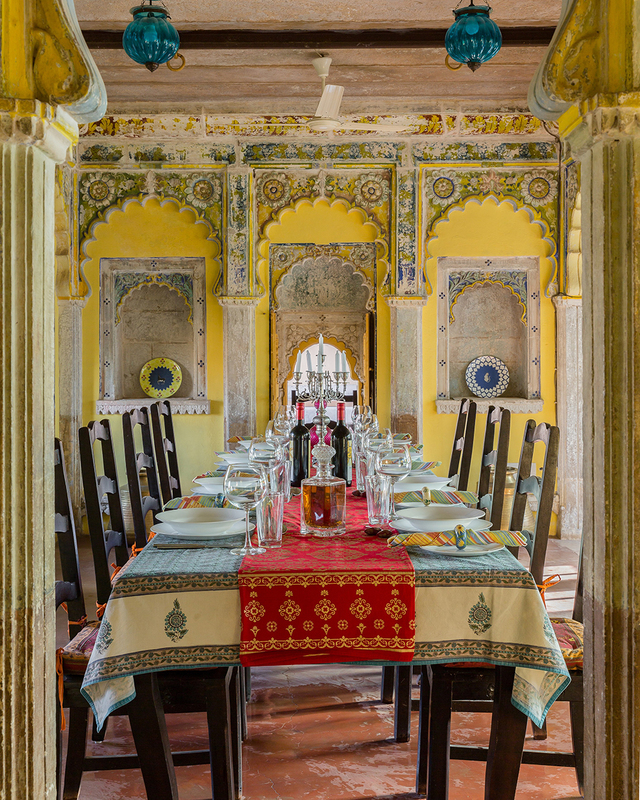 Encompassing the serenity of a pearl, our main dining hall is one of the most stunning rooms in the Garh. Though airconditioned and fitted with modern amenities, the hall retains the original paintwork that was done by hand, using vegetable dyes. 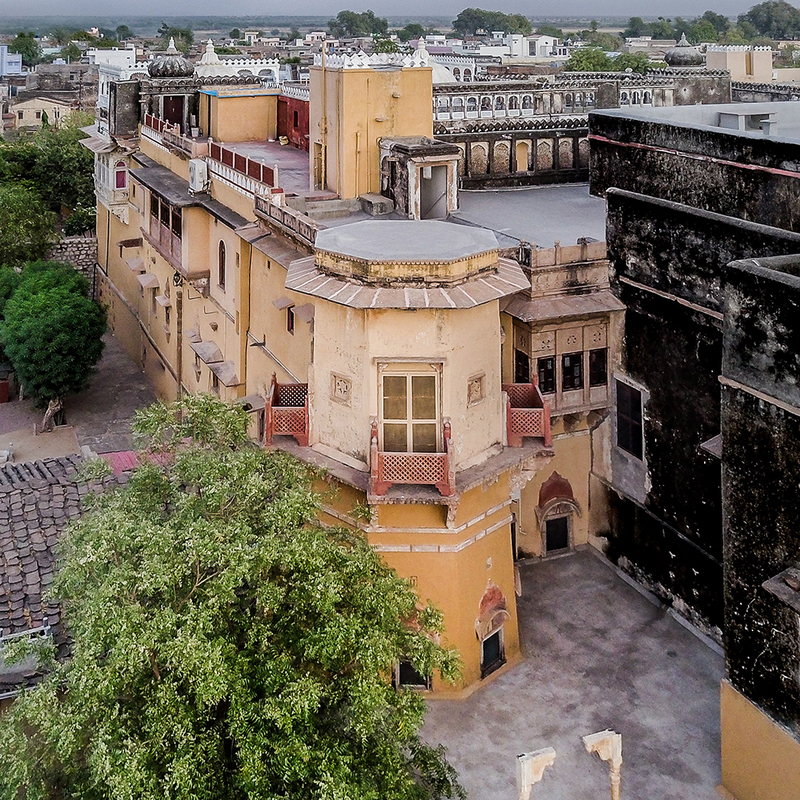 Soak in the view from one of the jharokhas, the hallmark of Rajasthani architecture, as you enjoy your breakfast and lunch here. Inspired by the clouds beneath which it stands, this is the rooftop terrace where dinner service is held under the cool night sky in the summer. The terrace offers a panoramic view of the village which our guests can enjoy while feasting under a blanket of shimmering stars. The National bird of the country, the Peacocks, are the oldest residents of the Garh. The unique beauty of this bird inspired the name for our winter dinner service location. 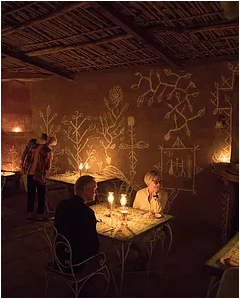 Built like a house in the village with mud walls and local artisanal drawings on the walls, Mor Chownk is an ideal location for dinner by a bonfire on cold winter nights. 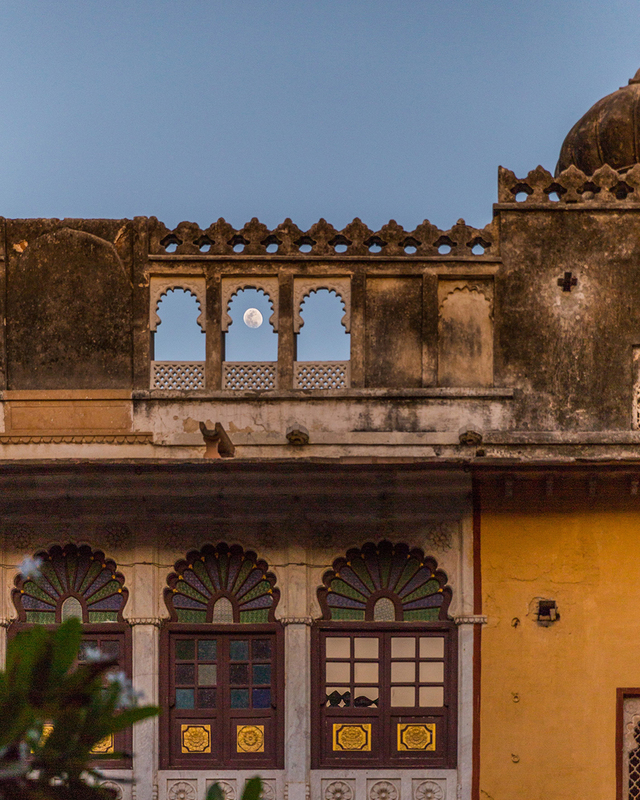 In the evening, as the vermilion sun sets in the horizon, enjoy the spectacular view from our Hawa Mahal as you sip a cup of tea and partake of your evening snacks.